I have had the itch to go camping for the past few weeks. I missed going on a spring (April) camping trip. We planned on canoeing on Little Black Creek for a daytrip, but that got pre-empted as well. Finally, Skip and I planned a quick overnight shake down canoe camping trip for Friday night. We decided as an early May trip we would go somewhere that would be too crowded. We settled on either Indian Lake (preceding NYS’s summer fee season) or Moss Lake. The weather forecast called for possible thunderstorms so we opted for the smaller Moss Lake. I picked up Skip at 2pm and we were on the water by 3:20pm. Moss Lake is a very small but pretty lake, less than three quarters of a mile across. There is a hiking trail around the entire perimeter and a small sandy beach for a swim. The parking lot is close to the sandy put in, which has a nice, gradual entry. On one side of the lake there are rising hills with a few bare rock outcroppings. There is a tiny island with an osprey nest at the top of a dead tree. Moss Lake has 8 free, secluded water access sites with outhouses and fire pits. One of the sites is handicap accessible. The access site has a map and site reservation system where one slides the campsite number from Open to Occupied. There was one group staying at the large group site #2. Skip and I opted to reserve site #4 on the point, hoping for a breeze to keep the black flies abated. We paddled counter clockwise around the lake and checked out the other sites thinking we could swap sites and change our reservation if we found something better. As we cruised around the lake we saw three loons. Campsite 4 was clean. As we unloaded dark clouds were moving in, so as Skip dragged in firewood I set up our tarp. We broke up the fire wood and covered it with the canoe as the brief shower passed through. Afterwards we cleaned the fire-pit. The fire-pit was filled to the brim with charcoal and old ashes, but there was little trash or garbage in the fire-pit. We troweled 4 shopping bags full of ashes and dumped them in the outhouse. As I opened the outhouse door I saw the toilet paper that had been left there was shredded into a mouse nest with two beady eyed occupants. They didn’t like the fact that I dumped their nest down into the pit, but I wasn’t looking forward to using an outhouse with surprised mice running around in it. On the island across from the point there was a osprey nest. The osprey nest was being watched by ravens which would fly in if the nest was left unoccupied. The ospreys were quite vocal and although we saw them out fishing several times we never saw a successful catch returned to nest. It wasn’t possible to determine if there were eggs or little ospreys in the nest. We set up our tents and sleeping systems and decided to take another tour around the lake, mainly to escape the black flies. The osprey peeried over the nest and spied on us the whole time. It was about 6pm when we returned to our site so we built a fire for cooking our hot dogs. The wood was a little damp on the outside from previous rain and it smoked a little – which was ideal for ridding the black flies. We had a simple meal of hot dogs, sauerkraut, and beans. After dinner we watched two of the loons put on a splashing display, not the “Penguin Dance” or by flapping their wings, but by splashing primarily with their feet. Although the two loons remained 15-20 yards apart, I wonder if there wasn’t a mating ritual aspect to the display. We sat up around the fire until 9:30pm listening to the loons on the lake and a barred owl in the woods. At one point the three loons were all calling back and forth as fast as possible to be nearly simultaneous. I have never heard anything like that. We received more showers during the night and both Skip and I had single wall solo tents. Large, hard rain drops would create a fine mist inside the tent. I wouldn’t say I got wet, but I am not sure I would want to be in this tent for a full night in a long rainstorm. I was awoken at several points during the night from loud loon calls – an interruption I will gladly accept. We awoke at 6am, packed up our tents and made breakfast. At home I had prepared scrambled eggs with crushed bacon, fried mushrooms and onions. I put everything into a ziploc bag and froze it for the trip. Now I cooked the eggs in boiling water while sipping on coffee. The eggs came out fine. We were paddling out by 8am. A nice trip. 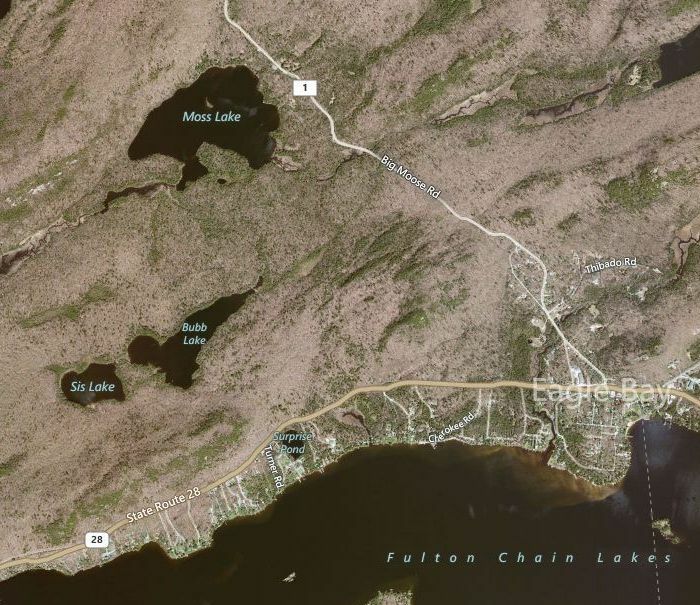 Because Moss Lake is fairly close to Old Forge, it is popular– especially in the summer. Spring or fall paddles here will be more peaceful, but it’s pretty no matter when you go. Moss Lake is worth repeating as a late fall or early spring trip in 2010. From Eagle Bay on Route 28 turn left onto Big Moose Road and drive for just over 2 miles. There is a decent-sized parking lot on the left, with a trail leading down to the lake and another going around the lake. There is a short carry to the water.